In person registration available at RunnersWorld Tulsa until Saturday, December 8th, 5:00pm or sign up race morning starting at 7:30am!! Every finisher receives a unique medal for each half completed. These medals connect together to form a Taijitu - the symbol for Yin Yang. Together the medals represent a balance between running on trails and pavement. Read more about Yin Yang here. Incredibly Awesome Tech Shirts for all entrants if you register in time! Fully Stocked, World Famous Aid Stations! Ample Nine Hour Time Limit! Great food Provided After the Race! Awards for the Top 3 Male and Female for Each Event! Bring a new unwrapped toy for the kids that will go to Project Elf. 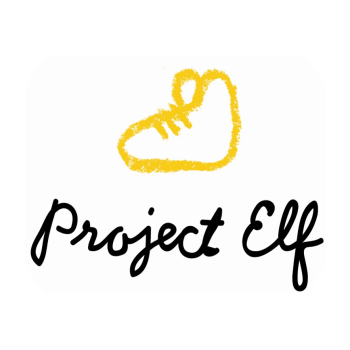 Project Elf is a volunteer-based, non-profit organization that works wonders for Tulsa schoolchildren in need of the basics most of us take for granted, such as clothes, shoes, school supplies, and personal hygiene products. All gifts will be collected at the race and given to Project Elf who will distribute the toys to children in need. The races start and finish at the Turkey Mountain main (lower) parking lot located at 6800 S. Elwood Ave. The Trail Half Marathon is an out and back course with a turn around at the Westide YMCA. 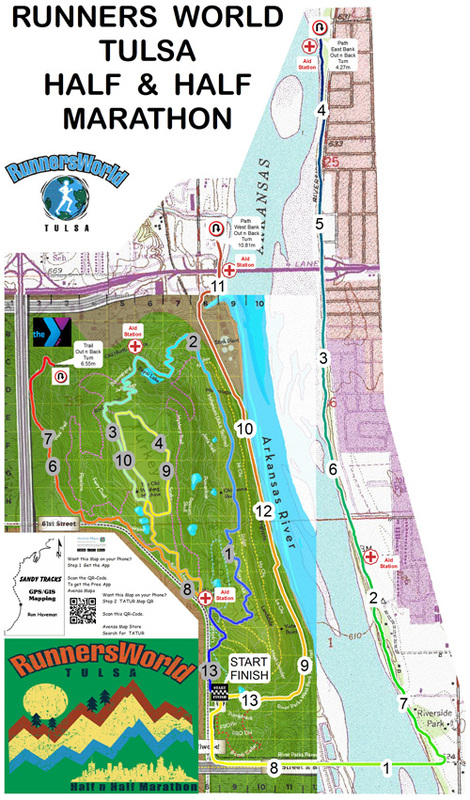 The Paved Half Marathon is entirely on the Riverparks paved trail system. There is a nine hour time limit for all races. All courses will be marked with pink ribbons and signs. Thanks to fellow runner and geologist Ron Haveman of Sandy Tracks Mapping we have an interactive version of the Half N Half Marathon course map. 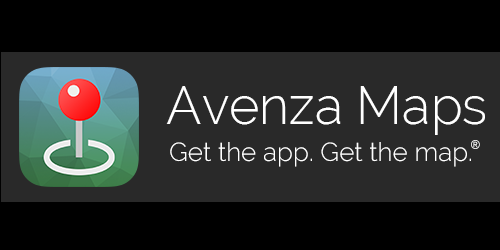 With this map and the application you can easily track your current location on the course using your mobile phone. All races start on the trail near the main parking lot on Turkey Mountain - 6850 S. Elwood Ave.
All races start at 9:00am. Courses close at 6:00pm with a 9 hour time limit. Parking at the main and upper Turkey Mountain lots are limited and will fill up early. There will be additional parking at the lower lot that can be accessed from 71st St. Look for signs and orange wearing parking assistants. Register on-line through December 6th or in person at RunnersWorld Tulsa, 3920 S. Peoria Ave through December 8th. Registration will also be available on race day starting at 7:30am. Sign up early to receive a shirt. We will most likely be out of shirts if you wait until race day! 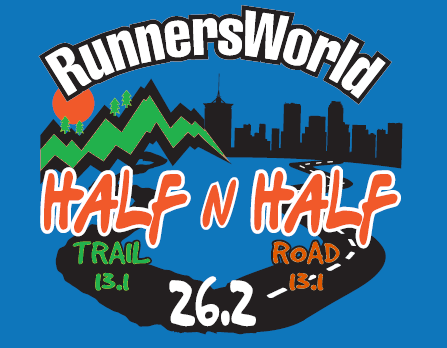 Packet pickup will be on Friday and Saturday at RunnersWorld Tulsa, 3920 S. Peoria Ave.
You can also pickup your packet on race day starting at 7:30am. We are not able to mail packets but you can have a friend pickup your packet. Your race number bib is required and contains your electronic timing chip. Please wear it on the front of your body. If you think you might shed a shirt or a jacket during the race we recommend that you pin your bib to your shorts/sweats/tights. Avoid folding the timing chip on the back of your bib as it will not record your time if broken. It is best to wear the bib with the numbers up (not sideways). If you forget your bib on race day go to the registration table to get a new number assigned. Full aid stations are available every 2-3 miles and will include water, Gatorade, and sweet & salty snacks. Pacers are not allowed during this race. Friends or family that want to run with you must be registered. Refunds are not available if you can't attend the race. You can still pickup your packet or have someone pick it up for you. All ages are welcome at this race; there is no age limit.